The summer vacation season is almost at an end and the ramp-up into a new school year has begun. I had hoped I’d get out the follow up to my post about managing information overload ages ago, but you all are so insightful and generous with your thoughts that I’ve been sitting on a mass of really interesting replies trying to synthesize. In the end, I think I’m going to have to break this up into manageable pieces, quote a lot of you liberally, and point out the commonalities and surprises that I’ve seen arise. In broad strokes, I’ve seen four themes appear; managing information intake, storing information, separating inspiration from information, and the importance of making time to learn. Being mindful and deliberate about how you expose yourself to the firehose of information that is the Internet is one strategy that many people employ. Jasper Visser has a simple twofold strategy to managing his information intake; namely, “RSS and letting go. I use RSS feeds to keep up with the stuff that’s really important. If – on top of that – I accidentally read twitter, scan Facebook or (even!) peek at Google+ I consider that a lucky moment. With all these social networks I trust on serendipity to take my side. Hardly any of the myriad of updates I miss every day really mattered in the long run. I don’t have to speculate on the iPhone 5 design (nor, really, does anybody) so I made peace with twitter just scrolling along on its own. If there’s stuff I’m really missing out on over and over again, and there’s no RSS feed to fix that, I consider it a business opportunity ☺” Jasper’s strategy of “letting go” I find very important. It took me years to reach the point where I could accept that I would never again keep up with all the information out there on the Internet. In happier days, the bother of setting up mail filters that were accurate enough to capture and route the right messages to the right folders was more than repaid by the ease with which I could look at my incoming email stream, see where the activity was, and choose where to direct my attention at any given time. I can do some of that with Mail, but with nowhere near the granularity I used to. My inbox tends to be much more cluttered now and it is a drag on my productivity to have to wade through all those messages. My favorite response regarding email was from Nancy Proctor. I had emailed several friends with personal requests to share their thoughts and strategies, and her reply began, “To start with, I tend not to read emails this long but prefer a phone call if there is this much info to exchange (not being snarky, seriously! )” Granted, the email was 577 words long, but this was certainly not the answer I was expecting! We had a good long talk and in the end I appreciated her insistence on having a single high-bandwidth discussion rather than a series of emails. The level of engagement that direct voice communication allows, with clarifying questions and answers and the back and forth about issues I find to be almost impossible with email. This point was echoed by Kate Haley-Goldman, who said, “I’m still thinking about a Curator article that Nancy, Titus, and I were discussing over drinks in the middle of the night a few weeks back. (Was it useful because we were talking about it in person? Because it was an in-depth article? The drinks? The middle of the night? Perhaps all of the above.) Personally, I think it had everything to do with talking in person. This is the reason I go to conferences. The conversations that happen in the sessions, in the halls, in the bars; that’s where the really valuable information is exchanged. As a postscript to the email discussion, I offer this thought on “efficiency” and its pitfalls. A vendor I worked with had this annoying habit of never responding completely to emails. I’d thoughtfully gather up and email him all my thoughts on the latest version of what he had sent me, and he’d reply to the first question and ignore the rest. If I sent him three emails, each with one question, I’d get three answers. If I was efficient and sent one email with three questions, I’d get one answer. 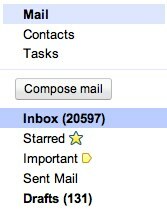 In hindsight, it was much more efficient to confine myself to one question per email. It seemed to reduce the length of time it took to get an answer. It certainly reduced the time I spent afterwards searching the email chain for that response on file formats that was buried in that email about the home page, or was it that email about the new comps? Since then, I’ve tried, with varying degrees of success, to treat work emails more like telegrams or IMs. If she had her druthers, Nancy would ditch most of her emailing for IM. As a result of this, I’ve downloaded NetNewsWire and started trying to tame my RSS feeds, I’ve cleaned out my inbox for the first time in months, and if trees stop falling down, I might even take another whack at making better filters in Mail. Next up, systems for storing the stuff you find once you find it. From there, I’ll delve a bit into a brilliant point Kate Haley-Goldman made about separating inspiration from information, and wind up with thoughts about making time to learn. Thank you all for your replies! Next Post: When should we have the September Boston Museum Tech Meetup? Thanks, Gretchen! It’s not too late to add your 2¢! Thanks so much for your post. I know so little about RSS, but can understand the purpose. I’m just trying to make the most sense out of Linked In vs Facebook vs Twitter. You originally asked how we use them. Linked In really doesn’t do much for my business other than help me research the backgrounds of people with whom we might do business. Yet, I continue to link to people frequently in case some good use comes out of it. Facebook is definitely a friends and family connection. It works very well for me and creating sense of community with former colleagues. I feel as if we are all chatting on the way to the water cooler. My company has a Facebook page. We have loyal fans and yet our numbers creep up incrementally unlike Twitter and Linked In which grow constantly. I have not be successful at getting people to post comments on our company page. Twitter is the best. I use it to find updates on design, architecture, museums, and business. Followers who are strangers find me to follow which makes Twitter feel like a circle of contacts. I still am not sure I know the way to get the most out of Twitter or perhaps I’m a slug about posting pearls of wisdom! I would appreciate any comments on how to use any social media better. Speaking of information overload… I’m just getting to this post. It’s been sitting around my RSS for a few days. How does Gmail compare to Eudora and Mail?